The shoulder is a ball and socket synovial joint. It has a ball (the head of humerus) articulating with the flat socket called the glenoid. The stability is dependent on the bony contours being intact, the cartilage and labrum (the rim of the socket) being competent, the capsule not too loose or torn, and the ligaments (static structures connecting the humerus and glenoid) strong and adequate. The muscles and tendons help move the joint and contribute to its stability. 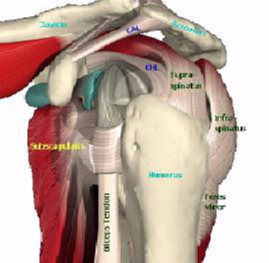 The muscles closely applied to the joint are the rotator cuff muscles of Supraspinatus on the top, the subscapularis in the front and the infraspinatus and teres minor at the back. Muscle insertion pattern provides infinite variety of moments around humeral head to rotate humerus. The acromion is a flat plate of bone above the shoulder joint and is like a scaffold.